Football practice is tough. The focus on necessary skills and the endless repetitions of these drills can cause players to lose enthusiasm and get sick of practice. When this happens players effort falls and their attention to detail drops. The best way to combat this is by creating competition within the practice plan. There are a variety of place where competition can be incredibly effective, but it does not fit every setting. It’s important to make sure that the players have a firm grasp on the skills you are asking them to use when they go into competition. Competitive drills are not the place to learn a skill, they are the place to apply the skill. It’s critical that athletes have a strong fundamental foundation before they begin to compete using their skills. Creating full team competitive match ups is relatively easy. When you put the starting Offense against the starting Defense it picks up the energy of practice and gets all of the players excited. While this is an important thing to do, it does not develop skills as much as when competition is brought down to the individual and unit levels. At the individual level, matching up position groups is a great way to work on skills and spice up practice. This can be especially effective late in the season when athletes have a base set of skills and need to work on applying these skills in competitive environments. Some individual drills that lend themselves to competition are the Golden Yard Drill, Board Drills, One on One pass rush and one on one pass routes. To increase team involvement you can keep track of the score for the offense and defense and give the winning team some type of reward. These competitive drills can be brought into a wider scope to include different units of the team. A great example of this is the Perimeter Drill that puts the receivers running outside screens like Bubbles and Jail Routes against the Defensive Secondary. Another great example is the whole team pass rush. In this drill the Offensive Line will work to protect the Quarterback against a variety of different blitzes. The last drill is the classic Three to Make 10 Drill where 3 Offensive Linemen and a Running Back have three downs to move the ball 10 yards against 2 Defensive Linemen and a Linebacker. 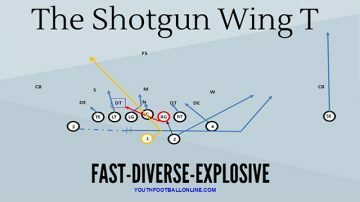 This drill can be changed up to have Wide Receivers blocking Defensive Backs or Running Backs blocking Linebackers to get more players involved. Competition is a great way to increase the energy of a practice. It is a great tool to inject some passion and get players to increase their effort level but it must be used wisely. If the coach starts putting competitions before players have mastered their skills he will be setting up the players to develop bad habits. Competition is a tool that can give great results, but it must be used properly.